Discussion in 'Religion & Philosophy' started by Margot2, Feb 12, 2019. Kyklos, Saganist, Gorgeous George and 2 others like this. I am struggling with a new computer so here's my comment. Neither HItler nor Stalin were liberals or socialists and there is tons of evidence. Americans should educate themselves before going off on some tangent. Kyklos, Gorgeous George and HereWeGoAgain like this. Hitler’s National Socialism, and quickly the only National Socialism which mattered, wished to promote those of ‘pure’ German blood, removing citizenship for Jews and aliens, and promoted eugenics, including the execution of the disabled and mentally ill. National Socialism did promote equality among Germans who passed their racist criteria, and submitted the individual to the will of the state, but did so as a right-wing racial movement which sought a nation of healthy Aryans living in a thousand year Reich, which would be achieved through war. In Nazi theory, a new, unified class was to be formed instead of religious, political and class divides, but this was to be done by rejecting ideologies such as liberalism, capitalism, and socialism, and instead pursue a different idea, of the Volksgemeinschaft (people’s community), built on war and race, ‘blood and soil’, and German heritage. Race was to be the heart of Nazism, as opposed to class focused socialism. STALIN CAME to power after the defeat of the international revolutionary wave of 1917-23. As post-revolutionary Russia was besieged and encircled, the working-class activists who had made the revolution vanished from the scene. Many were killed by counterrevolutionary armies in the civil war; others starved or fled the cities in the famines that followed the blockade. With the working class in a state of political collapse, Soviet society was coordinated by an army of factory managers, bureaucrats and high state officials. By the middle of the 1930s, the Russian Communist Party--which still claimed to be a revolutionary socialist party of the working class--was mostly made up of managers, army commanders and state bureaucrats. Stalin came to power as the leader of these managers and commanders. The Communist Party, in possession of state power, used its position to exploit and oppress the working class. Under Stalin's regime, workers were denied the right to bargain collectively. They required state permission to move from city to city. Workers who missed one day of work could be dismissed. Being dismissed, they could be evicted from their home. Resigning their job without permission left workers barred from future employment: If they worked in a military industry, they could be sent to prison for eight years. Strikes were described as "counterrevolutionary sabotage," and strikers could face the death penalty. Unsurprisingly, the Stalinist regime enforced gross inequality of the kind found in any capitalist society. Senior figures, like army marshals and high government officials, earned 100 times as much as the average worker (according to official Soviet figures). Beneath the red flags and inspiring songs, society under Stalin became dominated by workplace managers and military commanders, with their needs enforced by police: a mirror of Western capitalism. The leaders of this society called it "actually existing socialism" and promoted their interests through the sympathizing Communist parties around the world. Like any managers, they had much to fear from an international revolution. STALIN, IT is often said, defeated the Nazis in World War Two. The Nazis did inflict extraordinary destruction on the Russian population, before finally being defeated militarily. But during the decisive period in which Adolf Hitler came to power, the Stalin-affiliated German Communist Party was encouraged to do nothing, and to prevent the development of a unified working-class anti-fascist movement. It is no exaggeration to say that the Stalinist influence on the German Communist Party allowed Hitler's rise to power. The Communist Party of Germany had, over the previous 10 years, been systematically meddled with by Stalin's bureaucracy, "unreliable" leaders being driven out and tame bureaucrats installed in leading positions. By the time of Hitler, this formerly revolutionary party was a real "Stalinist" party of the classic type: It could be relied on to follow instructions from Russia without dissent. At the end of the 1920s and beginning of the 1930s, one of the key concerns of Stalin and his German supporters was to prevent any German Communists from collaborating politically with non-Stalinist workers: Any political authority that rivaled Stalin's was a threat to the political power of the Russian managerial class. This priority was far more important to the Stalinists than fighting the rising Nazi movement. Between 1928 and 1930, the Nazis increased their vote from 800,000 to 6.5 million. They were on a potential path to power, and workers were crying out for united action against fascists. But united, militant working-class action would threaten Stalinist bosses, as it would threaten every other boss: so instead of raising the alarm and taking the lead, the German Stalinists encouraged complacency. "The only victor...is the Communist party," declared one of the German Stalinist leaders after Hitler's party made significant electoral gains. "We are not afraid of the Fascist gentlemen. They will shoot their bolt quicker than any other government," he declared in parliament. When the rival, non-revolutionary Social Democratic Party proposed united action of all socialists against the fascists, the Communist Party declared this to be "the most serious danger that confronts the Communist Party." Just over a year later, Hitler was in power, and the German socialist movement was smashed. The Stalinists had achieved their goal: No rival ideas had been encountered by their German adherents. The price was the coming to power of Hitler, the Holocaust and the Second World War. Three years later, the Stalinist revulsion at working-class power again helped fascists to power: this time in Spain, when, during the revolutionary civil war against the fascist general Francisco Franco, the Communist Party took the lead in breaking up the revolutionary working class movement in Catalonia, abolishing its militias and crushing its general strike. In both Germany and Spain, the Stalinist regime--always prioritizing its own class interests--paralyzed and crushed workers' organizations, just as they were entering life-and-death struggles with surging fascist movements. Like any other exploiting, ruling class, the Russian Stalinists were more interested in dominating humanity than in fighting fascism. FRANZ BORKENAU, an Austrian writer who traveled to Spain, wrote that there, Stalinism was not really part of the workers' movement: Rather, it was "the extreme right wing" of the Republican (liberal) coalition. The Stalinist parties' fear of independent working class organization meant that from the 1930s to the 1960s, they increasingly came to be known as right-wing political groups with nothing to offer radicals. The U.S. Communists of the 1930s declared themselves adherents of "20th century Americanism" and worked hard during and after a huge strike wave, which threatened to reshape U.S. politics, to ensure that the energy of workers was redirected into the Democratic Party. During World War Two, the Stalinists broke strikes, persecuted trade union militants and celebrated workplace speedups and pay restraint. By the 1960s, Stalinists in the U.S. were praising the warmongering Democratic President John F. Kennedy, even as the movement against the Vietnam War emerged. Partly, this conservatism suited Stalin's foreign policy--while he was alive. But it also emerged from the logic of Stalinism itself, which was to collaborate with bosses against the working class in Russia and around the world. Much of the rebellion of the 1960s was directed against the right-wing Communist parties, whose conservatism led to betrayals that shocked radicalizing youth. A generation of young militants never forgave the French Communist Party for its role in sabotaging the great general strike of 1968. Stalinists there systematically wound down the explosion of factory occupations, discouraging workers from linking up with one another and driving that outburst of struggle directly into a great defeat. Similarly vile betrayals gradually disintegrated most European Communist parties. The Communist Party of Australia advocated that trade unions suspend strikes and instead just campaign for the ALP. Demoralized and directionless, they dissolved themselves at the start of the 1990s. Most of these betrayals have now been forgotten. Online Stalinists enthusiastically defend slave labor, gulags and the extermination of political opponents--perhaps because they seem subversive. But these methods have nothing to do with Marx's conception of communism as an emancipated, classless society; they are the methods of exploiters and oppressors, which is why they went hand in hand with the right wing, class-collaborationist liberalism that the Stalinists would rather forget. Kyklos, Gorgeous George, HereWeGoAgain and 1 other person like this. Gorgeous George and HereWeGoAgain like this. Gorgeous George, HereWeGoAgain and RiaRaeb like this. 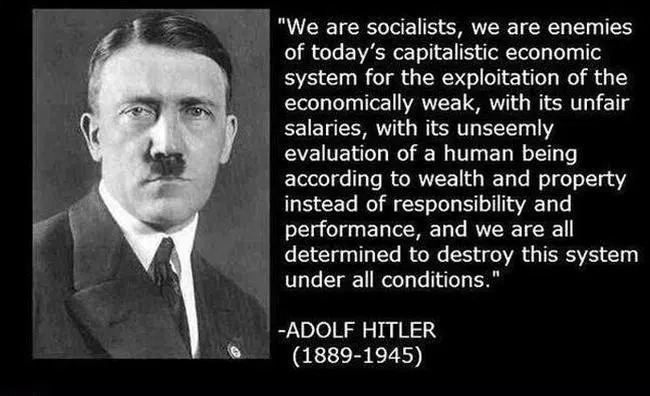 Not only was Hitler not a socialist himself, nor a communist, but he actually hated these ideologies and did his utmost to eradicate them. At first this involved organizing bands of thugs to attack socialists in the street, but grew into invading Russia, in part to enslave the population and earn ‘living ‘ room for Germans, and in part to wipe out communism and ‘Bolshevism’. 63572"]Not only was Hitler not a socialist himself, nor a communist, but he actually hated these ideologies and did his utmost to eradicate them. At first this involved organizing bands of thugs to attack socialists in the street, but grew into invading Russia, in part to enslave the population and earn ‘living ‘ room for Germans, and in part to wipe out communism and ‘Bolshevism’. Hitler - the balrog of Margot. hitler was a liar like trump. Well, when it comes to lying about being a socialist, I think you may be looking at the entirely wrong side of the aisle. Hitler was the leader of a tribe that thought it was superior to the rest of the people on earth. And probably not a new idea, for it was probably held by various tribes throughout the history of humanity. To some degree or another. Their technology they developed for ww2 was ahead of us, for as a tribe, they are very intelligent, at least when it comes to science and technology. They must have thought they deserved to rule the world, for a thousand years. Superior beings, Aryan, the most intelligent line of humans on earth. Germany's problem was Hitler. He didn't have the right stuff to fight an intelligence driven war of conquest. He was probably insane if the truth be known. Or just evil, take your pick. Gorgeous George and Margot2 like this. Right wing hero, and beneficiary of Republican Wall Street largesse, Hitler may not have been socialist but the record clearly shows he was a Christian. Gorgeous George and Kyklos like this. Hitler had originally joined when the party was called the German Worker’s Party, and he was there as a spy to keep an eye on it. It was not, as the name suggested, a devotedly left wing group, but one Hitler thought had potential, and as Hitler’s oratory became popular the party grew and Hitler became a leading figure. Trump claims he's a Christian.. His Pastor says he has NEVER set foot in church. Wonder why Margot is so intent on trying to clean up the reputation of Socialism? Is it that Ocasio Dortez is giving her a tingle up the leg? Adolf Hitler was a very discriminating socialist. Good times for the in-crowd. Death for the Jews. Everyone has a different definition of what words mean.. communism, socialism, liberal, progressive, fascist etc. They think Hitler was a socialist and nationalized industry..
Arabs have been merchants, capitalists and traders since thousands of years before Islam. Who you talking about, specifically?